The bezel has one bend from the setting. Other than this it is in excellent condition. No breaks to the filigree. No repair. No stone damage. 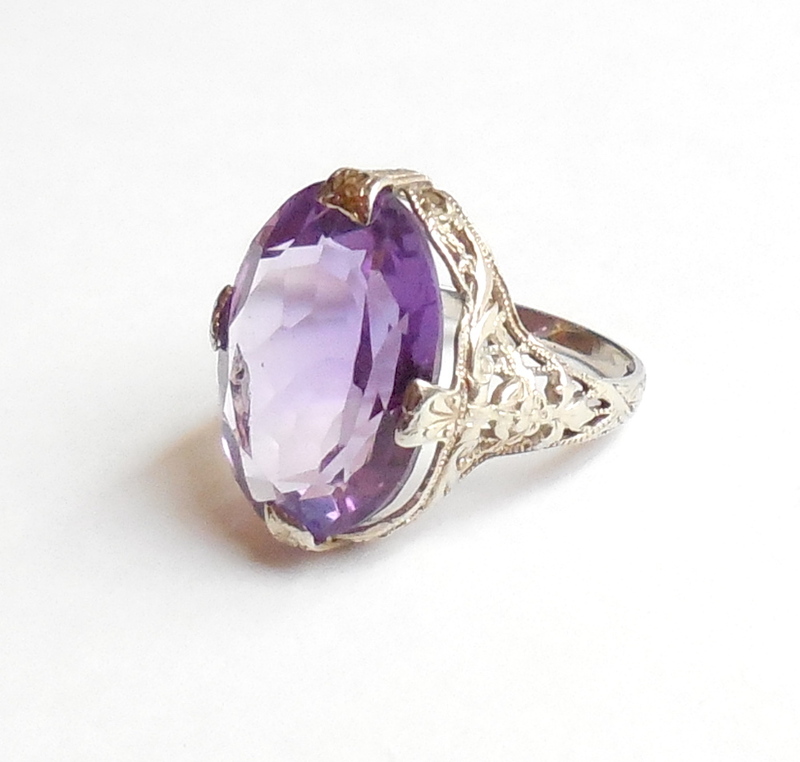 A gorgeous estate ring for your antique jewelry collection. 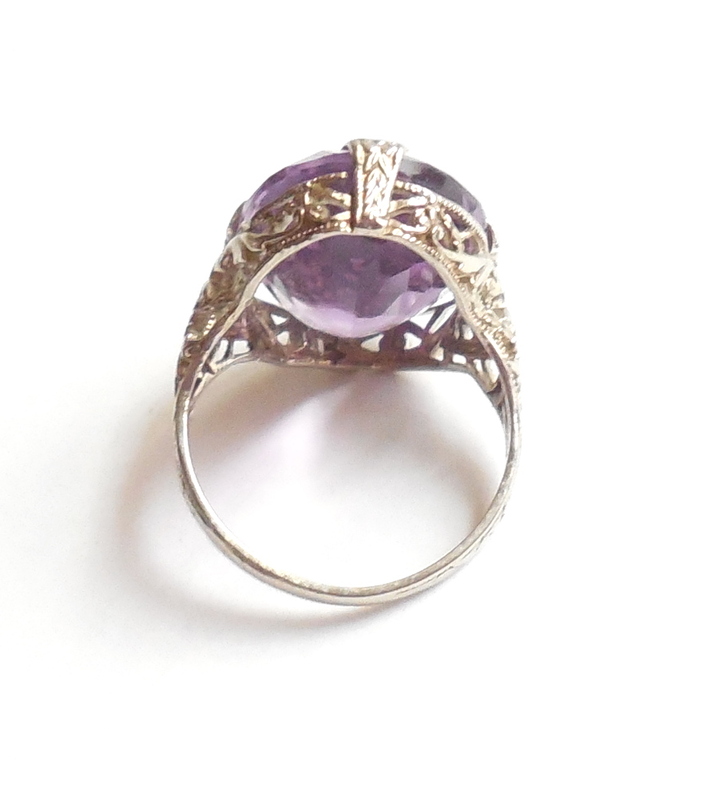 This is a gorgeous1920s Edwardian Art Deco 14K Gold Fancy Filigree Amethyst Ring from an estate with a stunning natural gemstone. 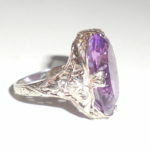 It is marked 14K, jeweler tested and Guaranteed to be solid 14K white gold with a large oval cut amethyst in the center. As is commonly found with period jewelry from this era the ring size is quite small but can be resized by any good jeweler. The stone is very large and deep so the culet or point is ever so slightly below the undermount. This is not noticeable when the ring is worn on the finger and it doesn’t fit any differently than any other ring. The setting is very beautiful with deeply carved flowers on the sides, fancy filigree open work that goes all the way around the stone, tiny millgrain style edges and deep carved doublewide prongs to hold the stone in place. 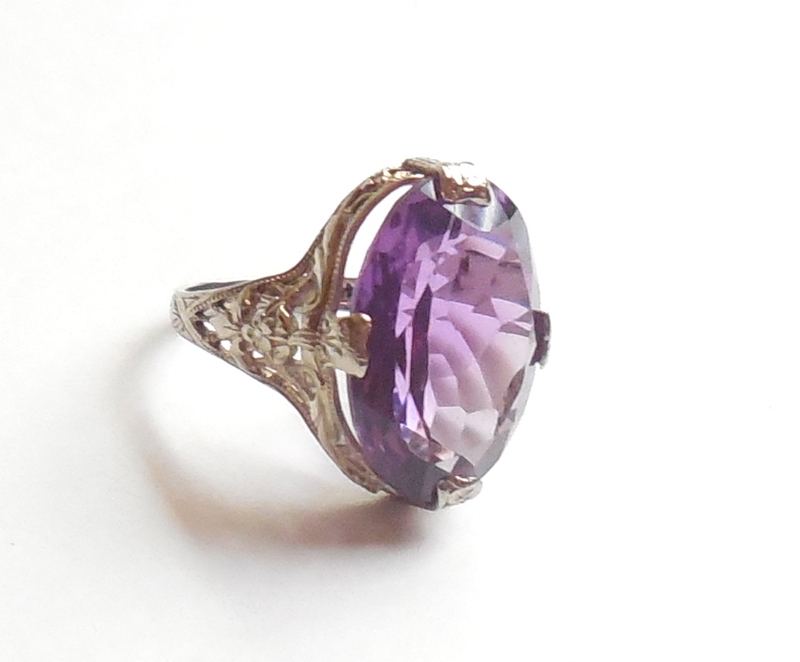 The stone is a little large for the setting likely due to 2 very tiny dings, one of which is under the prong so you can’t see it but the stone is a beauty. 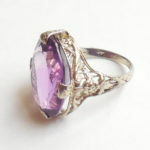 It has deep rich purple color with lots of lavender to pink flashing. It also has great clarity and brilliance where you can actually see through each and every facet. Ring size is 4 1/2. 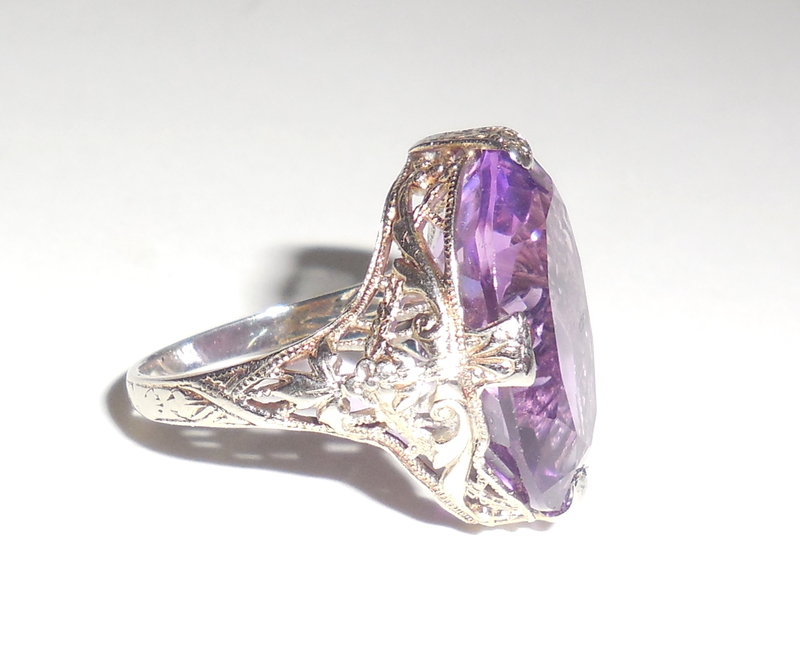 Gemstone carat weight is approximately 12 carats. 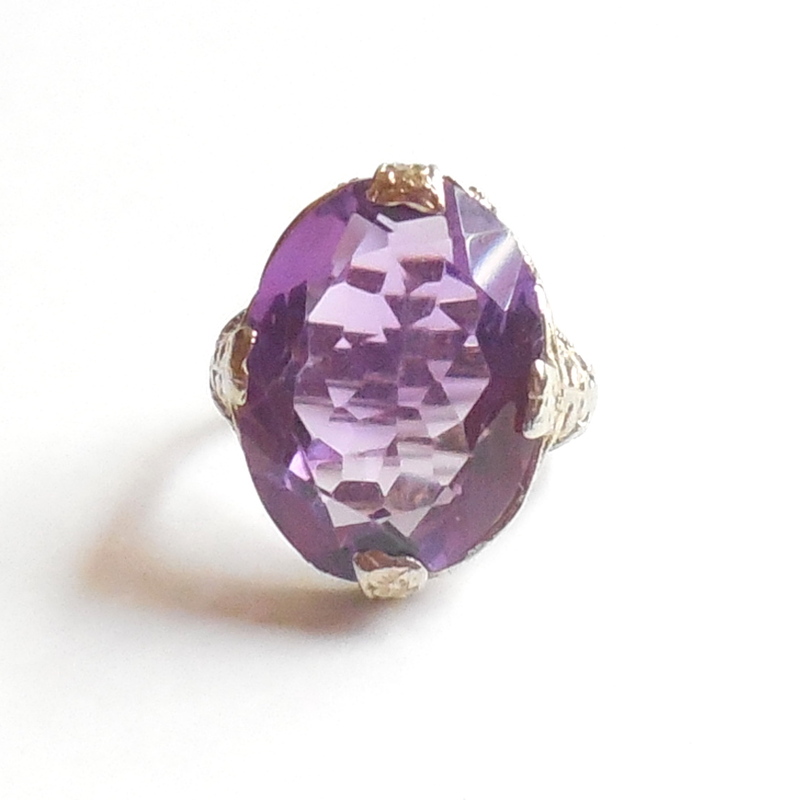 Size of amethyst is quite large at 18mm by 12mm. Condition of stone is excellent. No cracks, nicks, chips, flakes, inclusions or abrasions. 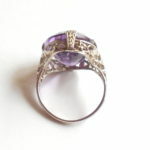 Gorgeous stone in this ring and it is set securely. 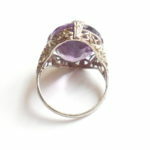 Overall, this is a lovely early 14K gold amethyst ring for your antique and vintage jewelry collection. 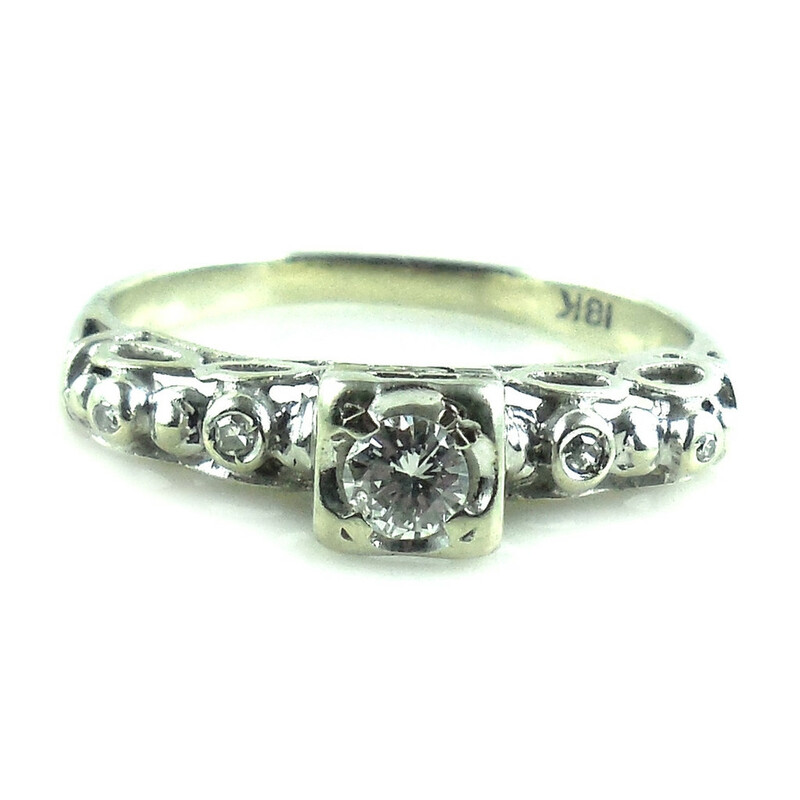 This is an antique Art Deco 18K white gold diamond ring with a beautiful hand made, hand cut, Art Deco fancy geometric setting. It is marked 18K. The top measures 3/4" long East to West and is 1/4" tall in the center. The diamond is a good quality old brilliant cut with SI1/2 quality and near colorless H/I color. Very crisp, clear, bright and sparkly. Ring size is 6 3/4. Weight is 2.3 grams. Total carat weight is .2 carat. The shank is still thick and strong. 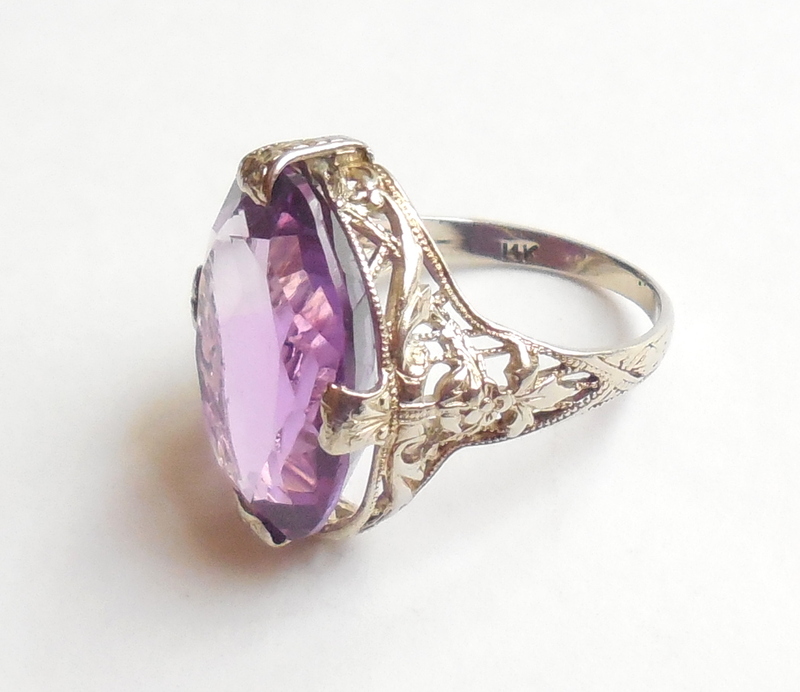 This is a lovely diamond ring for your antique and vintage jewelry collection. 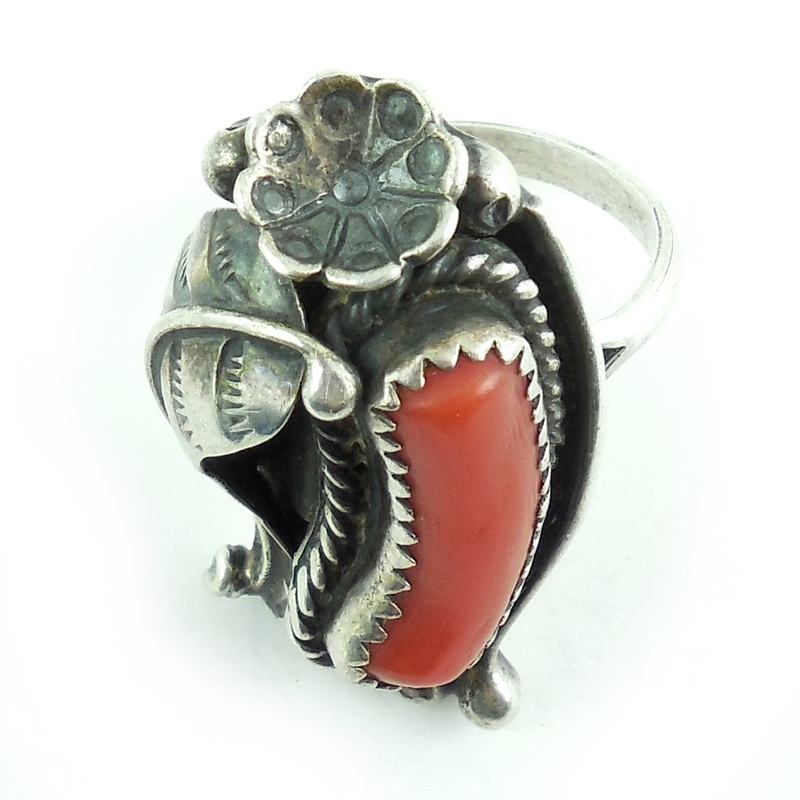 This is a large vintage Navajo Native American hand made sterling silver and red coral ring. Tested and Guaranteed to be solid sterling silver. It is long and beautifully hand crafted. The red coral is old and natural and still has deep rich red color. Not dyed. It is 19mm long. Size of the top is just about 1 3/8" tall North to South by 7/8" across East to West. The sterling silver is thick, solid, and substantial. In excellent, gently used condition this is a gorgeous, showy, vintage 1960s-1970s statement ring for your collection. This is a vintage USA Made, 14K yellow gold large showy diamond ring with .5 carat of crisp, clear, fine quality brilliant cut diamonds. The top setting for the stones is 14K white gold while the rest of the ring is 14K yellow gold. The diamonds are much better than average quality and have near colorless G color. Most have VS clarity and some are SI1. Ring size is 7. The top measures 1 1/16" long North to South by 7/8" wide across the open space East to West. Weight is heavy 6.6 grams. 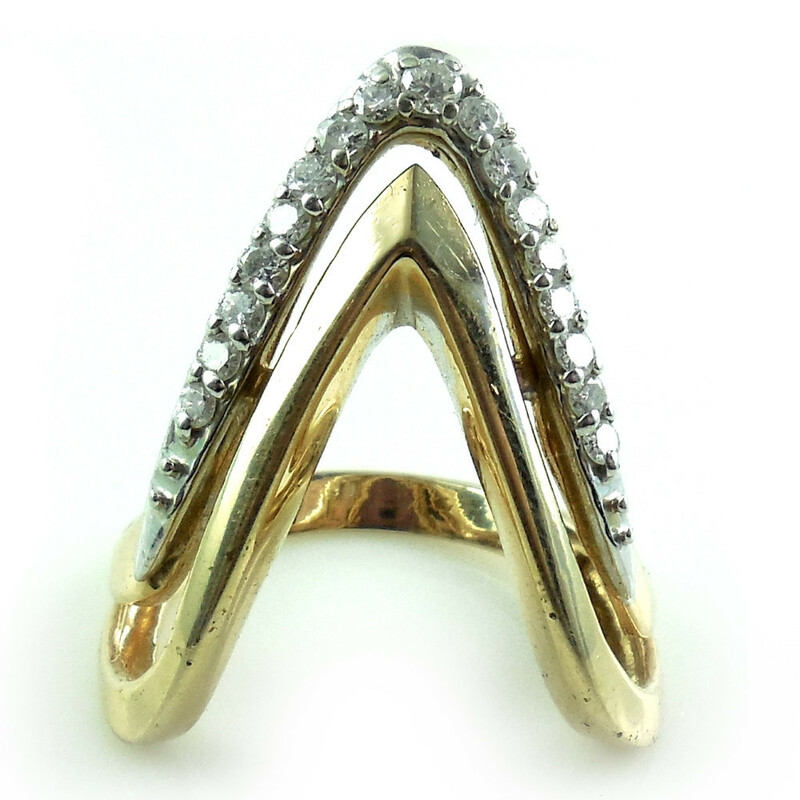 The 14K gold is very thick and substantial. You can actually see the gold thickness of just the diamond setting on the photos above. 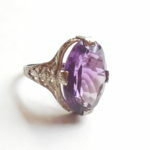 This is a stunning vintage modernist ring for your collection. Fine quality and will cover the knuckle to knuckle section of your finge Please email with any questions. 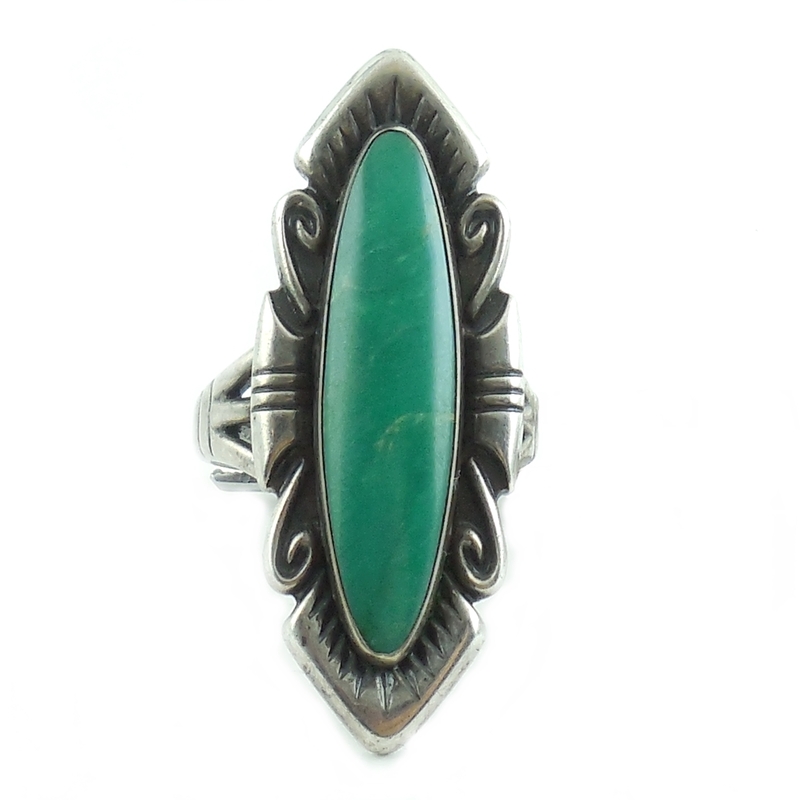 This is a long, vintage, Handmade, Native American Indian sterling silver turquoise ring. Marked, tested and guaranteed to be solid sterling silver. Also has a maker hallmark that looks like a kokopelli. It has fine quality hand crafting, is very strong and well made. The top measures over 1 1/2" long North to South by 5/8" wide East to West. The carving is crisp and deeply recessed. The turquoise is 29mm long and natural mined ....not reconstituted. Ring size is 8. Excellent Conditon. 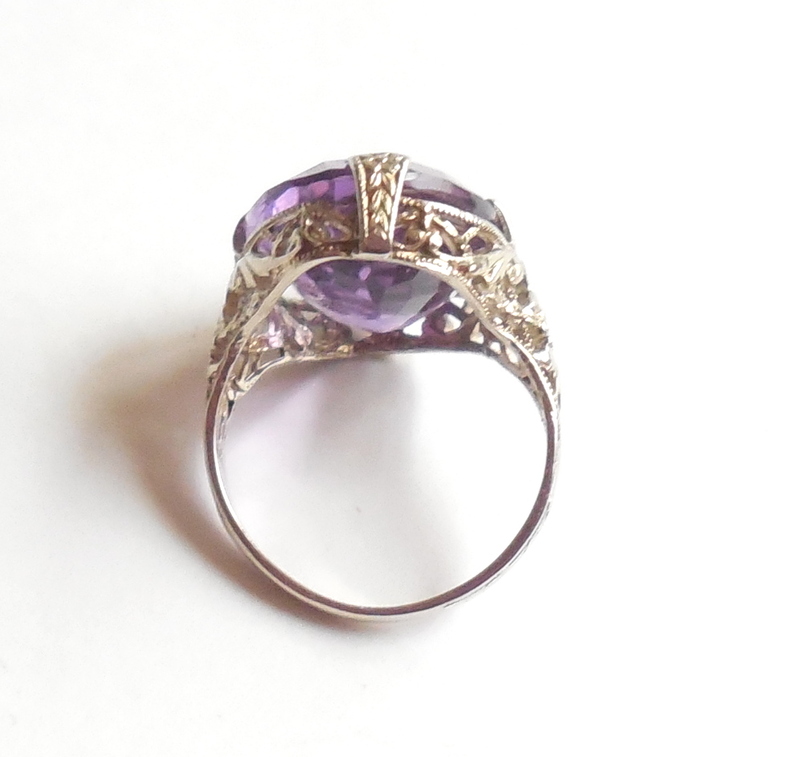 This is a gorgeous ring for your collection. Nice quality with a great, showy look.